An extensive analysis of the relationships of nine-primaried passerines (tanagers, New World warblers, sparrows, buntings, etc.) by Barker et al. 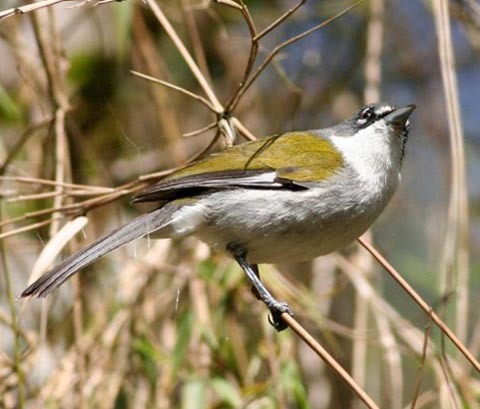 (2013) found firm evidence of evolutionary sets of "tanagers" that arose on islands in the Caribbean. Indeed, those authors even went so far as to propose four new families from this radiation [Spindalidae, Nesospingidae, Phaenicophilidae, Calyptophilidae]. Initially cautious, I placed these together in 2016 in just one family; now, following Winkler et al. (2015), I've now elevated all Families as Barker initially proposed. Barker et al. (2013) stated that among the Caribbean lineages "the only truly unambiguous relationship is the unity of the Hispaniolan endemics Phaenicophilus, Xenoligea, and Microligea." The genus Phaenicophilus holds the two palm-tanagers — Black-crowned Palm-Tanager P. palmarum (left in a fine photo by Murray Lord) and Gray-crowned Palm-Tanager P. poliocephalus. Black-crowned Palm-Tanager is one of the most ubiquitous of Hispaniola’s endemics, present in just about any wooded habitat in the Dominican Republic and the eastern half of Haiti. 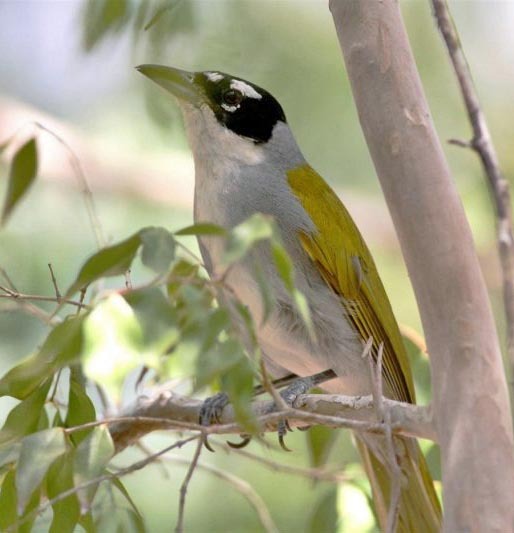 Gray-crowned Palm-Tanager is Haiti's lone avian endemic. It is still relatively common in the forest of the Tiburan peninsula where it occurs from sea-level to the highest forested peaks at 2400m. It is said to be especially common in the karst limestone rainforests of the Macaya Biosphere Reserve, a loosely protected national park high up in the Massif de la Hotte (Keith et al. 2003). Despite the English names we use for the two palm-tanagers, these are not tanagers. They've been called "tanagers" in the past, and so we can continue to do so. We just need to recognize that there are many birds called "tanagers" that are now classified in other families [to use just one example, Scarlet, Summer, and Western Tanagers, familiar to North American birders, are actually in the cardinal/grosbeak family Cardinalidae]. This Black-crowned Palm-Tanager (right) is backlit against the thick morning fog in the cloud forest at Cachote, Dominican Republic. The final two members of this Family are traditionally called "warblers," but they are not closely related to the Parulidae. These are Green-tailed Warbler Microligea palustris and White-winged Warbler Xenoligea montana. Green-tailed Warbler — better called Green-tailed Ground-Tanager (below left in a photo by Murray Lord) — joins mixed species flocks in a variety of woodlands (thornscrub to broadleaf), primarily in the understory on montane woodlands in the Dominican Republic (its range quite limited in Haiti). White-winged Warbler — which might be called Hispaniola Highland Tanager (below right, another Murray Lord shot) —occurs in both Hispaniola nations, but its range is limited to humid montane broadleaf and wet karst limestone forests (Keith et al. 2003). It is rather little-known; the first nest was only discovered in 2004. Photos: Murray Lord photographed the Black-crowned Palm-Tanager Phaenicophilus palmarum, Green-tailed Warbler (Ground-Tanager) Microligea palustris and White-winged Warbler (Hispaniola Highland Tanager) Xenoligea montana during a visit to the Dominican Republic between 26-28 Apr 2009. The backlit Black-crowned Palm-Tanager was at Cachote reserve, Dominican Republic, in Feb 2017. Photos © Don Roberson except those attributed to © Murray Lord, and used with permission ; all rights reserved. Bibliographic note: There is no "family book" per se. 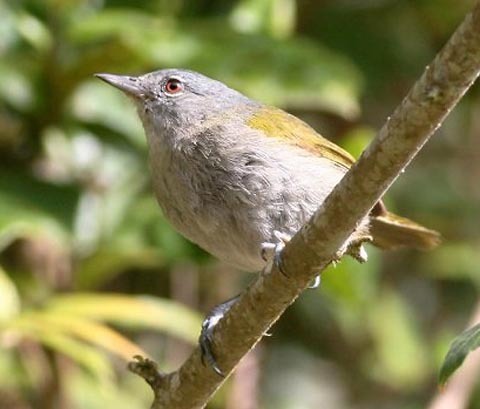 The species in this set have been previously covered in books on tanagers, such as Isler & Isler (1987), or the applicable chapters on "warblers" or "tanagers" in the Handbook of the Birds of the World series. Barker, F.K., K.J. Burns, J. Klicka, S.M. Lanyon, and I.J. Lovette. 2013. Going to extremes: contrasting rates of diversification in a recent radiation of New World passerine birds. Syst. Biol. 62: 298-320. Isler, M. L., and P. R. Isler. 1987. The Tanagers: Natural History, Distribution, and Identification. Smithsonian Instit. Press, Washington, D.C.
Keith, A.R., J.W. Wiley, S.C. Latta, and J.A. Ottenwalder. 2003. The Birds of Hispaniola. Nat. Hist. Mus., Tring, U.K.